Katy, Texas – April 8, 2019 – Saturday night marked the 2019 Pin Oak Charity Horse Show’s final Grand Prix, and fun was had by all. As with every Pin Oak Grand Prix, the Catalena Cowgirls started off the night with their iconic performance. With only four clear in the first round from a field of 20 horses, Monica Hanks’ Abracadabra WKT, ridden by Faces of Pin Oak rider Daniel Bedoya, bested the competition to take the blue ribbon in Saturday night’s Wells Fargo $30,000 Grand Prix. This is the first grand prix win for Abracadabra WKT, known in the barn as ‘Abby.’ Monica and her husband, Steve, were glowing over the win and when they were awarded the High Point Grand Prix Owner Circuit Award. For his rides on Quattro and on Abracadabra WKT, Daniel Bedoya was also awarded the Antares Leading Grand Prix Rider Circuit Award. Clock-Wise CSH, owned by Comly Sport Horses and ridden by Happy Comly, took a close second in Saturday night’s prix. The prix and the Abbot Downing Ringside Gala also included the presentation of a number of awards. The top three jumper riders of all three weeks of the competition were presented with the $10,000 Pin Oak Charity Horse Show Jumper Rider Bonus. This year’s Leading Jumper Rider Bonus was awarded to Trapp O’Neal while Martien Van Der Hoeven and Scott Lenkart took second and third, respectively. Both the Grand Prix Style Award and the Leading Lady Grand Prix Rider Circuit Award went to Jill Gaffney and Freestyling Farms, LLC’s Jordan. Sunday marked the end of the 2019 Pin Oak Charity Horse Show, and it was an appropriately gloomy day, with thunderstorms and flash flooding causing many of the final day’s outdoor classes to be cancelled. In the pony ring, So Enchanted, owned by Ticket to Ride, LLC and ridden by Carolyn Colter, was crowned Champion in the Small Pony Hunter division while Paris, owned and ridden by Lola Head, was the Champion Medium Pony Hunter. Despite the rain cancelling the end of the show for the Large Ponies and Green Ponies, the Championship in the Large Pony Hunter division and the Pony Hunter Circuit Award went to Poplar Place Pied Piper, owned by Isabella Mullan and ridden by Brooke Brombach. Cool Spot, owned by Jennifer Wheeler-Winborne and ridden by Megan Winborne, was this weeks’ Champion in the Green Pony Hunter division while the Reserve Championship and the Green Pony Hunter Circuit Award went to James Waldman’s Waltzing Matilda, ridden by McKayla Brombach. McKayla Brombach also received the Best Child Rider On A Pony award for her tremendous efforts on her many rides over the three weeks of competition. “This weekend was a little rough, but it ended on a good note. I’m so honored to have received the Best Child Rider award,” said McKayla of her show. “It was really cool for my sister and I to go head to head for the circuit award. It was really close, and even though Brooke beat me for the regular pony circuit award, our green pony turned around and was circuit champion in the greens,” she continued. In the Junior Hunter ring, Symbolic and Bella Kay received the 3’6” Junior Hunter Circuit Award as well as the Championship in this week’s 3’6” Junior Hunter 16-17 division, winning all four over fences rounds. Bella Kay and Symbolic also received the Antares Leading International Derby Rider Circuit Award on Friday evening following a third place finish in this week’s International Derby. “I was so excited just to be able to earn the International Derby Rider award since that is usually won by a professional. Then Symbolic won all four of our junior hunter trips this week, giving us champion for the weekend, circuit champion for the juniors, and the high point hunter award. He is just the best and always comes out wanting to win!” said Bella. “This is my 5th year coming to Pin Oak and definitely my best one yet. It’s for sure my favorite horse show in Texas and one of my favorite shows of the whole year. I love the atmosphere, the competition, and the cause!” she continued. After a great day in the equitation ring on Saturday, Eleanor Rudnicki continued her winning ways with Donald Stewart’s Bertolucci. The pair was crowned Champion of the 3’3” Junior Hunter and received the 3’3” Junior Hunter Circuit Award. “I was so proud with how consistent Bert and I were all 3 weeks. He was riding really well and jumping great, so it was amazing when it all came together. This was also one of my last shows on Bert, so it was pretty special to win the circuit championship,” said Eleanor of her big wins. Despite the thunderstorms and flash flooding causing the second day of the Children’s Hunter division to be cancelled, South Haven Farm’s Snickers and Lilly Goldstein received the Children’s Hunter Circuit Award as well as the Reserve Championship in this week’s Children’s Hunter 14 and Under division. The Champion in the Children’s Hunter 14 and Under division went to Paloma, owned and ridden by Avery Hansen. This week’s Champion in the Children’s Hunter 15-17 went to Penelope OPL while Who Dat, ridden by Rachael Harrower and owned by Maura Harrower, was Reserve Champion following a tremendously successful week in the combined High Performance and 3’9” Green Hunter division. Olive, owned and ridden by Ryan Grissom, was Reserve Champion in the Modified Children’s Hunter received the Modified Children’s Hunter Circuit Award. For the equitation riders, Pin Oak ended with several medals, mostly in the jumper ring, on Sunday. Savannah Hemby took the prize in the Platinum Performance Talent Search aboard Sterling Equestrian’s Kasarco O.H. Catherine Shurtleff and Cayden A.
Catherine Shurtleff won the USHJA 3’3” Jumping Seat Medal aboard her own Cayden A. Tessa Downey and Double H Farm’s HH Moonshine took second. Tessa and HH Moonshine also took second in the Hamel NHS 3’3” Medal to Peyton Rathbun aboard Abigail Albrecht’s MTM Flashdance. Gerico, owned and ridden by Portya Muenke, took the win in the WIHS Equitation Jumper Phase. The WIHS Equitation Hunter Phase was won by Katia Cannon aboard Donald Stewart’s Canal Street. Hallie Grimes took the overall blue ribbon in the WIHS Equitation aboard Brookside Pine Farms, LLC’s Thrift Shop receiving second in both phases. The pair also took second in the Platinum Performance Talent Search. In the jumper ring, the Championship in the High Amateur Owner Jumper division went to Fine Fleur and Bethany Glenn for the second week running. Quicksilver and owner Katherine Huffstutler were crowned Champion in the High Junior Jumper division. Billyboy, owned by by McKenzie Mills, earned the Championship in the Low Amateur Owner Jumper division while Mozart’s Symphony, owned by Jacqueline Wilson and ridden by Owen McWilliams, claimed the Championship in the Low Junior Jumper division. Portya Muenke aboard her Eurohill’s Alcatraz took both the Championship in this week’s High Children’s Jumper division and first in the $10,000 High Child/Adult Jumper Invitational. The High Adult Amateur Jumper Championship went to Ramiro Cruise, owned and ridden by Isabel Harbour. H&M Cisco owned by Katlynn Butler and ridden by Katie McDonnell claimed the Championship in this week’s Low Adult Amateur Jumper division. Tyler Mayer’s Windelinde and Tessa Downey rode to the Championship in the Low Children’s Jumper division. Riders, spectators, officials, and volunteers are all feeling a special sense of accomplishment as they make their way home from this iconic horse show knowing that both their fun and hard work has helped contribute to a great Texas tradition and to a wonderful cause. Katy, Texas – April 7, 2019 – The Booth Show Jumpers $30,000 USHJA International Hunter Derby and Houston Modern Luxury “Bourbon, Bow Ties, and Big Hats” Derby Party on Friday night at Pin Oak Charity Horse Show Week III in the Irish Day Farm Main Indoor Arena brought fun, excitement, and many big hats. After winning the National Derby earlier that afternoon and earning the Antares Leading National Derby Rider Circuit Award, Jennifer Alfano conquered again in the International Derby ring. After coming into the handy round in third place, she secured the win aboard her own Candid. Faces of Pin Oak rider, Natalee Haggan, rode to a second place finish in Friday evening’s International Derby aboard MTM Here’s 2 You, owned by Candu Farm. Natalee and MTM Here’s 2 You were awarded the Emerging Professional Rider award as well as the Grand 3’6” Professional Hunter Championship award last year at Pin Oak Week III. Junior rider Bella Kay and her Symbolic rode to third place in Friday night’s derby after winning the Week II ‘Hunt and Go’ USHJA International Derby and coming in second place in the Week I USHJA International Derby, earning them the Antares Leading International Hunter Derby Rider Circuit Award. Having just celebrated her three year anniversary with Symbolic, Bella was on cloud nine after her incredible three weeks in the Pin Oak International Derbies. MTM Do Right, one of Didi Mackenzie’s two entries and the first horse on course in Friday night’s International Derby, and his groom, Manuel Tamayo, were presented with the award for the Best Turned Out International Derby Horse. Didi Mackenzie’s second entry, MTM Inside Scoop, earned a sixth place finish in Friday’s Derby following an incredible day in the Amateur Owner ring. Just as a champagne toast commemorated Pin Oak 2019’s first International Derby during Week I, the Week III International Derby was completed with a champagne toast to celebrate the final derby of Pin Oak 2019. Junior riders buckled down on Saturday with hopes of securing big wins and circuit championships during Pin Oak 2019’s final weekend. In the equitation ring, Luke Jensen rode Stephanie Tropia’s CR True Color to the win in the ASPCA Maclay medal first thing Saturday morning, while last weeks’ Dover Saddlery/USEF Hunter Seat Medal winner, Grace McReynolds of Colorado Springs, took second place aboard her own Kabaltic. Tessa Downey, last week’s Maclay winner, took third aboard HH Moonshine. Following the ASPCA Maclay, Eleanor Rudnicki and Brookside Pine Farms, LLC’s Kendrick took home the blue ribbon in the Dover/USEF Hunter Seat Medal on Saturday morning. Eleanor and Kendrick also took the blue in this week’s 14 and Under THIS National Children’s Medal. After earning a fourth place finish in Friday night’s International Derby and a fourth place finish in the ASPCA Maclay, Canago and owner Miranda Seade took second to Eleanor in the Dover/USEF Hunter Seat Medal. The win in the 15-17 THIS National Children’s Medal again went to Hannah Buskin and Ava Williams’ Fedor, winners of a class of 31 riders in the Week II THIS National Children’s Medal. Equitation riders are excited to see who will be crowned the 3’6” Equitation Circuit Champion following the remaining Pin Oak Week III medals to be held on Sunday. While sponsors and spectators are looking forward to Saturday night’s circuit award presentations and the Wells Fargo $30,000 Grand Prix and Abbot Downing Ringside Gala, riders are looking forward to Sunday’s division championships and circuit championship awards to wrap up the final week of Pin Oak 2019. Katy, Texas – April 6, 2019 – As divisions wrapped up during the final week of the Pin Oak Charity Horse Show, Grand Champion Circuit Awards began rolling in. In addition to the Pin Oak Grand Champion Circuit Awards, Antares Sellier France sponsored awards for High Point Riders, many of which were also crowned as the week came to a close. On Wednesday afternoon, Rachelle Goebel’s Will Emblazon defended his undefeated status in the Hunter Breeding ring, earning the Best Young Horse Circuit Award. Will Emblazon (Willemoes x Anastasia / Zarr), known at the barn as ‘Oakley,’ has blazed his trail through the Hunter Breeding 3 Year Old division this year. This big bay with a unique blaze remains undefeated in the Hunter Breeding 3 Year Old classes at all four weeks of the 2019 Great Southwest Winter Series and all three weeks of the 2019 Pin Oak Charity Horse Show. He was also awarded Best Young Horse at six of those shows and Reserve Best Young Horse at the remaining one. Will Emblazon was bred by Hil Cat Farm in Folsom, Louisiana. Emily Belin helped Goebel find this horse as a four month old. He showed some as a yearling and ended the 2017 show year as 5th in the USEF Yearling Hunter Breeding division and Champion in the USHJA Zone 7 and THJA Yearling Hunter Breeding divisions. He has shown at Pin Oak every year since he began showing, and he was last year’s Pin Oak III Hunter Breeding 2 Year Old winner and Best Young Horse. “Oakley has matured into a beautiful young hunter prospect,” said owner, Rachelle Goebel. Between the two horse show series, Will Emblazon was also started under saddle and seems to enjoy his new job. “He is extremely laid back and has an amazing trot and canter. The hunter breeding divisions prepared him to be started under saddle such that all of his rides have been delightful,” Rachelle explained. Will Emblazon is shown by the sister team of Rachelle Goebel and Felicia Carroll. Rachelle tries to show him around her work schedule, and Felicia fills in when Rachelle is travelling. Felicia showed him this week, pulling out big wins; in addition to again winning the Hunter Breeding 3 Year Old and the Best Young Horse Championship, Will Emblazon was also awarded the 2019 Jane Queener Memorial Hunter Breeding Award presented by Kim Queener. The Jane Queener Memorial Hunter Breeding Award was created 11 years ago to commemorate Jane S. Queener. Jane bred and owned the Thoroughbred stallion Jones Hall, and she was an avid supporter of the Hunter Breeding divisions. Didi Mackenzie and her MTM Inside Scoop defended their title as last year’s 3’6” Amateur Owner Hunter Circuit Champion, earning the award again this year as well as the Championship in the California Split 3’6” Amateur Owner Hunter division this week. Mackenzie’s MTM Do Right was also Champion in the California Split 3’6” Amateur Owner Hunter this week. The 3’3” Amateur Owner Hunter Circuit Award went to Caitlin Burns’ Querida, who was also Reserve Champion in the 3’3” Amateur Owner 18-35 division this week to Champion, Ashley Kyle’s Suits You. Meanwhile this week’s Championship in the 3’3” Amateur Owner 36 And Over went to Shaw Johnson Price’s River. Lightful, owned by La Primera Hacienda, LP, had a stellar turn out at all three weeks of Pin Oak, earning the blue ribbon in all but one of this week’s Adult Amateur 50 And Over classes with Angela Dominguez, the win in the Adult Hunter Classic, the Championship in the Adult Amateur 50 And Over division all three weeks, and the Adult Amateur Hunter Circuit Award. Lightful was also Champion of the 3’3” Performance Hunter division and received the Antares High Point 3’3” Performance Circuit Award with Courtney Lenkart in the irons. Lightful is no stranger to success at Pin Oak as last year’s High Point 3’0” Green Hunter Circuit Award winner. Good friends Eva Bisso and Hollis Hughes Grace had a blast and were Champion and Reserve Champion, respectively, in this week’s Adult Amateur 36-49 division aboard their Valobra and Hoopla while this week’s Adult Amateur Hunter 18-35 Championship went to SWS Presley, owned and ridden by Kimerly Guthrie-Fiveash. The Modified Adult Hunter Circuit Award went to Redding Ridge owned and ridden by Teriann Miller. The High Scoring Professional round was earned by Who Dat, owned by Maura Harrower and ridden by Will Roberts. Who Dat was also Champion of this week’s combined High Performance and 3’9” Green Hunter division. Boardwalk, owned by Carly Lazzari and ridden by Will Roberts, was this week’s Champion in the Conformation Hunter as well as the Conformation Hunter Circuit Champion. The Antares High Point 3’6” Performance Hunter Circuit Award went to Cascalo owned by Emma Flett and ridden by both Scott and Courtney Lenkart over the three weeks. Kersten Levine was crowned the High Point Emerging Professional Rider with Melissa Morey’s MTM All Smiles, shown in the 3’3” Green Hunter. The 3’3” Green Hunter Championship was awarded to Hoopla, owned by Hollis Hughes Grace and ridden by Peter Pletcher. The High Point 3’0” Green Circuit Award and the Week III 3’0” Green Hunter Championship went to Captain America, owned by Lori Mathews and ridden by Courtney Lenkart. Another of Lori Mathews’ horses, Alisto, was awarded Grand Champion 3’6” Professional Horse and the Week III Championship in the 3’6” Green Hunter division with Courntey Lenkart riding. The Antares Leading Texas Super Stake Circuit Award for the most money won in the Texas Green Hunter Super Stake went to Van Morrison, owned by Shadyside Farm and ridden by Peter Pletcher. Van Morrison also earned the Reserve Championship in this week’s 3’0” Green Hunter division. In the jumper ring, Hachianda Musterd owned by Freestyling Farms, LLC and ridden by Jill Gafney, earned the Young Jumper Circuit Award. Wednesday evening featured the $10,000 1.45M Welcome Stake, won by Islay Jumpers, LLC’s Corina with Martien Van Der Hoeven aboard. Fleur De Lis Farms’ Ziezo took a close second with Scott Lenkart riding. Thursday night’s big event was the Irish Day Farm $25,000 Grand Prix and Crooked Willow Farms Ringside Reception. Cragganmore 3, owned by Petschenig Showjumping, LLC and ridden by Peter Petschenig, took the blue ribbon in Thursday’s Prix. Faces of Pin Oak rider, Daniel Bedoya, took the red ribbon aboard his Quattro. Daniel and Quattro are a local favorite and winners of last year’s circuit Leading Grand Prix Rider Award. Bedoya also took 4th in Thursday night’s Grand Prix aboard Monica Hanks’ Abracadabra WKT, swapping places from last week’s $25,000 Grand Prix where he earned 2nd on Abracadabra WKT and 4th on Quattro. Daniel also recently received news that he will attend the Pan American Games in Lima, Peru this August riding for Bolivia. Friday at Pin Oak III was again ‘Derby Day,’ and the afternoon featured the Baggett Family $15,000 USHJA National Hunter Derby won by Kathy Chiaf’s Kindred with Jennifer Alfano in the irons. Kindred was also Reserve Champion in this week’s 3’6” Green Hunter division. RVF Titus, owned by Rio Vista Farm and ridden by Bill McMorris, took second in Friday afternoon’s National Derby. Hallie Grimes was the highest placing junior rider, earning third place on Brookside Pine Farms, LLC’s Thrift Shop. The completion of the third and final National Derby of Pin Oak also meant awarding the Antares Leading National Hunter Derby Rider Circuit Award. Jennifer Alfano dominated once again, receiving the $1,000 bonus prize and an Antares hunter bridle. Prior to the big event, Pin Oak Charity Horse Show welcomed four year old Arely, a brave young patient with a rare form of cancer who is now in hospice care. Arely came to Pin Oak with the hope of meeting a horse. In an overwhelming display of generosity and support, over 50 horses came to welcome Arely and help make her wish come true. Exhibitors and spectators are anticipating the final International Derby of Pin Oak 2019, Friday evening’s Booth Show Jumpers $30,000 USHJA International Hunter Derby as well as Houston Modern Luxury “Bourbon, Bow Ties, and Big Hats” Derby Party. The final Pin Oak 2019 Grand Prix will also take place Saturday night with the Wells Fargo $30,000 Grand Prix and Abbot Downing Ringside Gala. Matt Cyphert didn’t grow up in a horse family. His family didn’t push him into riding. He hasn’t been riding since he was a toddler. But he found his gift. Once bitten by the bug, Matt set his sight on the grand prix ring. He idolized Michael Matz. “He was so smooth on a horse. Just a class act and a great competitor,” he said. He also enjoys coaching riders, particularly from the psychological standpoint. “Finding what brings out the best performance in a rider changes from day to day. Some days you have to push them and other days you need pump them up,” he said. He himself rarely gets nervous about competing anymore, but if he gets amped up for a big class, he uses the same mental exercises he teaches his students to help him focus. Matt and his fiancé, Kelley Buringa, are now in the process of building a farm in Argyle and are excited to begin training there soon. “We have a great group of horses and clients and we love to watch them grow as riders and achieve their goals,” he said. Pin Oak has always been special to Matt. “I showed here as a junior and even then I realized it was not your typical horse show. It brings out the best horses and riders from all over the country. Winning a class at Pin Oak is an accomplishment to be proud of,” he said. His program works to have horses and riders peaking for the three week show, which he describes as a barometer on one’s riding and training. He also appreciates Pin Oak’s charitable donations. “It reaches beyond the sport and into the community with its influences. Its educational programs bring new interest to the sport every year,” he said. Patty Roberts started life as many young girls do: wanting a pony. And like many girls who want a pony, her parents knew nothing about horses. They had a friend whose daughter rode and recommended a lesson barn. “It happened to be a hunter jumper barn,” she says. “Honestly, I could just as easily have gone to a saddle horse or western barn. I just wanted to ride!” Patty was seven, and her life was shaped forever. Memorial Park Hunters is a well run business thanks to Patty’s dedication to staying organized. “I have weekly meetings with key staff so we can go over the individual needs of each client, both the equine and human client. We put everything on my calendar so we can see at a glance what is coming up in both the near and more distant future,” she explains. This level of organization helps them stay flexible as the year goes on and adjust to client needs in terms of which and how many shows they attend. They also keep clients up to date on vet and farrier visits via a newsletter, and tailor every horse or pony’s exercise and feeding schedule to their individual requirements. Memorial Park is located in the middle of Houston, with 40-45 horses at any given time. “We don’t have a lot of property so we stay on top of worming, runny noses, and so on to head off any potential problems,” Patty says. Safety comes first at Memorial Park. “It is important to us that our adults and children are well mounted and are being introduced to concepts that are appropriate to age and ability,” she says. Patty’s meticulous approach has paid off, with top placings in state and zone level shows and USEF national champions and reserves. She’s also has riders who rode with her as children return to her program after college, including her assistant, Amanda Dougherty. “I have watched her become a beautiful rider and very competent trainer and feel real pride in knowing I had something to do with that,” she says. She loves seeing former students become top professionals and compete in the upper levels of the sport, but is also pleased that her daughter Emma has chosen not to pursue a professional career in horses, and continues to ride and compete as an amateur. Patty has been involved with Pin Oak on many levels. “My daughter did her first lead line class there on her second birthday,” she remembers. She has served as chair of the horse show, taken many clients there to compete, and currently serves as the honorary co-chair of the host committee. “When I got involved with Pin Oak as a volunteer over 20 years ago, Lynn Walsh and I had a vision to make Pin Oak the premier Horse Show in Texas,” she says. “With the help of a lot of volunteers and sponsors, I feel Pin Oak is not only one of the best shows in Texas but in the country. 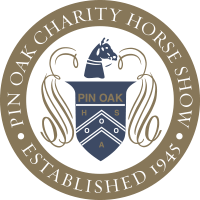 Pin Oak is not just a horse show, it’s an event.” On a personal level, Patty is proud of her part in contributing to the Pin Oak charity, Texas Children’s Hospital. Life has come full circle for Patty, who went from being a little girl who dreamed about horses to being the adult who helps little kids’ horse dreams come true. You’ll be sure to see her at Pin Oak this year with enthusiastic and well-prepared clients. Katy, Texas – April 1, 2019 – Week II of the 2019 Pin Oak Charity Horse Show has come to a close with many exciting wins and a new rounds of Champions crowned. NKH LLC’s NKH Caruso and Mathis Schwentker once again topped Saturday night’s Grand Prix following their win on Thursday night in the $25,000 Walter Oil & Gas Corp. Grand Prix. Six horses from the field of 28 progressed to the jump off, which allowed for plenty of galloping. NKH Caruso finished 1.2 seconds ahead of Jordan, ridden by Jill Gaffney and owned by Freestyling Farms LLC, who finished second in Saturday night’s Prix after winning Wednesday night’s $10,000 1.45M Welcome Stake. In April 2018, NKH Caruso (Cash & Carry x Dorina) won the $100,000 RFD-TV InIt2WinIt Speed Jumping Championship at the International Omaha with Christian Heineking. Mathis began riding NKH Caruso in October 2018 at the American Royal, where the pair won the $20,000 American Royal Grand Prix. Mathis and NKH Caruso have since had an incredible 2019, winning the $30,000 Smartpak Grand Prix at both HITS Coachella Desert Circuit I and II as well as the HITS Coachella Desert Circuit I $70,000 Back on Track Grand Prix. Prior to returning to NKH’s home state of Texas for the Pin Oak Charity Horse Show, the pair competed in the in the HITS Coachella Desert Circuit VIII AIG $1 Million Grand Prix and placed 14th out of 57 horses. Faces of Pin Oak rider Natalee Haggan and MTM Cravitz, owned by MTM Farm, were awarded the Grand Prix Style Award at Saturday’s event. Each year, Pin Oak partners with Texas Children’s Hospital to select ‘Honored Heroes,’ children who have overcome great obstacles medically and are on the road to recovery, to honor and host during certain of the many Pin Oak events. Pin Oak Charity Horse Show was proud to host Noah, one of Pin Oak’s Honored Heroes, at Saturday’s Hildebrand Fund $30,000 Grand Prix and Avalon Advisors Ringside Gala. Nine year old Noah is a Texas Children’s Hospital leukemia patient in recovery. He loves nature and animals and was so excited to attend the Pin Oak Charity Horse Show where he received a warm welcome and an up-close glimpse into the world of show jumping. On Sunday, riders dusted off their white breeches once again for ‘Classic Day’ in both the hunter and jumper rings. Week II of Pin Oak 2019 offered over $30,000 in classic prize money. Amidst increased competition with many new exhibitors arriving this week, several of the riders found in the Week I winner’s circle defended their positions at the top during Week II. HRS Fortuna and owner Hallie Rush repeated their Week I result earning Champion in the High Junior Jumper division. The pair also took the blue ribbon in the High Junior Jumper Classic. Contador De Bornival Z, owned by Kathy Taylor and ridden by Kathryn Taylor, and Fast Flo, owned by Nicole Peterson and ridden by Brooke Peterson, tied for the division’s Reserve Championship. Bethany Glenn and her Fine Fleur were crowned Champion in the High Amateur Owner Jumper division. Camaro 122 and owner Caitlyn Epperson took the division Reserve Championship and the blue ribbon in the High Amateur Owner Jumper Classic. Learning To Fly and owner Frances Barham earned the Championship in the Low Junior Jumper division, also repeating their Week I result, while Carly 10, ridden by Kathryn Taylor and owned by Kathy Taylor, was Reserve Champion and took the win in the Low Junior Jumper Classic. Athena and owner Hannah Newton were Champion for the second week in a row in the Low Amateur Owner Jumper, also taking the win in the Low Amateur Owner Jumper Classic. Meanwhile, Bart-C and owner Sarah Boyd took Reserve Champion. Maxim Investments’ Atomic and Samantha Reynoso rode to the Championship in the High Children’s Jumper division and as well as the High Children’s Jumper Classic while Washington, owned and ridden by Emma Flett, took Reserve Champion. AU Girl and Caitlyn Epperson earned the top prize in the High Adult Amateur Jumper Classic as well as the division Reserve Championship. Caitlin Hudson took the tricolor aboard her own Breeze. Avery Griffin aboard her Lyons Creek Action won the Low Children’s Jumper Classic and took Reserve Champion in the division. No Sky Too High and Laurel Walker earned the Championship. Silhouette CF and owner Hannah Colligan rode to the division Championship in the Low Adult Amateur Jumper and the win in the Low Adult Amateur Jumper Classic while Annette Diaz aboard her own Picture This tied with MTM Mrs. Yowza, owned by MTM Farm and ridden by Alexandra Gonzalez, for the Reserve Championship. The hunter ring saw many familiar faces in the winner’s circle as well. Kirby McCool’s Intrepido topped the field in the 3’6” Junior Hunter 15 and Under for the second week in a row with Khaki McCool in the irons. Candid, owned by Jennifer Alfano and shown by Grace Debney, took the Reserve Championship. Symbolic and owner Bella Kay, winners of Friday’s $30,000 Walsh and Albert USHJA International Hunter Derby, were crowned Champions in the 3’6” Junior Hunter 16-17 winning three of the four over fences classes. Canal Street, ridden by Katia Cannon and owned by Donald Stewart, took Reserve Champion. Emma Flett and her Cascalo bested the competition in the combined 3’6” Junior Hunter Classic. Donald Stewart’s Bertolucci was crowned Champion in the 3’3” Junior Hunter 15 and Under with Eleanor Rudnicki in the irons, swapping positions from Week I with Luke Jensen and Jill Barnett’s Coraggio PF, who took the Week II Reserve Championship. Gap Crown Horses, LLC’s Cassiopeia Cellestin, ridden by Ellie Peterson, took home the blue ribbon in the combined 3’3” Junior Hunter Classic and was again Champion in the 3’3” Junior Hunter 16-17 following a tricolor Week I. Emily Weimer and her own Cheers earned Reserve Champion. Quirrell, owned and ridden by Georgia Leb, took both the win in the Children’s Hunter 14 and Under Classic and the tricolor in the division. Week I division Champion Snickers, owned by South Haven Farm and ridden by Lilly Goldstein, was Reserve Champion. Oakhaven Partners, Ltd.’s Penelope OPL was Champion in the Children’s Hunter 15-17 with Riley Delbecq aboard while Zeppelin, owned by Lilah Bass and shown by Natalie Bass, earned the Reserve Championship. After a rough start to the week following an accident in the 3’3” Performance Hunters, Kelley Cloud’s Clintino won the Children’s Hunter 15-17 Classic scoring an 81.5 and an 86 with Brooke Brombach aboard. Taylor Landstrom’s Smash, ridden by Xia Tabanou, won three of the four over fences rounds in the Small Pony division, earning the Championship. Clara Keath and her own Peace Keeper rode to the Reserve Championsihp. Paris, owned and ridden by Lola Head, was Champion Medium Pony while Ticket to Ride LLC’s Smallwood Mystic earned the Reserve Championship with Carolyn Colter aboard. Lola Head earned top honors in the pony ring once again aboard her own Caleche, earning the blue ribbon in the combined Pony Classic as well as the Championship in the Large Pony division. Poplar Place Pied Piper, owned by Isabella Mullan and ridden by Brooke Brombach, was Large Pony Reserve Champion. The Large Green Pony Hunter Championship was earned by 14 Karat, owned by RGG Equestrian LLC and ridden by Reagan Gehm, for the second week running while Divide’s Chatterbox, owned by Linda Pryor and ridden by Isabella Fisher, took the Reserve Championship. The blue ribbon in the Green Pony Classic was earned by Cool Spot, owned by Jennifer Wheeler-Winborne and shown by Megan Winborne. Cool Spot was also Champion of the combined Small/Medium Green Pony division, maintaining the pony’s winning streak earning Champion or Reserve Champion at every show since stepping into the Greens this year. Divide’s Lady Chatterly, ridden by McKayla Brombach and owned by Amy Gangstad, took the Reserve Championship. Pin Oak’s equitation competition also wrapped up today with the final three medals of the weekend. Macy White and her Viva’s Glory, winners of the Week I Hamel NHS 3’3” Medal, won the USHJA 3’3” Jumping Seat Medal Sunday afternoon. Izabella Millimet won this week’s Hamel NHS 3’3″ medal on her own RVF Carlyle. Bella Kay continued her winning ways aboard her SWS Questionnaire in the Platinum Performance Talent Search for the second week in a row. As we head into the final week of Pin Oak 2019, riders who have been showing all three weeks are looking forward to Pin Oak Grand Champion Awards, Antares High Point Rider Awards, Jumper Rider Bonuses, and, for the Child and Adult Amateur Jumper riders, the Pin Oak Invitational Classics. Katy, Texas – March 31, 2019 – Saturday’s daytime schedule at Week II of Pin Oak 2019 was full of equitation medals, giving many of Pin Oak’s top junior riders a chance to shine. To add to the excitement, a cold front brought on by a series of early afternoon showers caused an abrupt change in weather that had many of the horses feeling particularly frisky. Riders cooled down while it was still hot during Saturday’s Ice Cream Social sponsored by Healing with Love and Woodway Equestrian, which wrapped up just as the warm weather began to fade into chilly showers. Despite pouring rain, Grace McReynolds of Colorado Springs, Colarado and her own Kabaltic were crowned the winners of today’s Dover Saddlery/USEF Hunter Seat Medal. “I felt pretty good going into the medal,” Grace commented. “All of the lines walked pretty straightforward, so that was nice. It was pouring down rain, but my horse was awesome and our course felt super smooth. My horse was great up the first line, stepping right up, and then the rest of the course really just flowed from there,” she continued. This is Grace’s second time at Pin Oak and her final year showing as a junior. Grace is excited to compete in the Dover Saddlery/USEF Hunter Seat Medal Final at the Pennsylvania National Horse Show this fall. Owen McWilliams and Tour Eiffel Du Mesnil, owned by Cold Spring Farm Investments, LLC, topped the WIHS Equitation Jumper Phase while Brooke Brombach and Spygate, owned by Show Hunter Investments, LLC, took the blue ribbon in the WIHS Equitation Hunter Phase. However, it was Bella Kay, winner of Friday afternoon’s $30,000 Walsh and Albert USHJA International Derby, and her SWS Questionnaire who were consistent enough to earn the top prize in the overall WIHS Equitation. Izabella Millimet won this week’s Hamel NHS 3’3″ medal on her own RVF Carlyle. Hannah Buskin and Fedor, owned by Ava Williams, came out on top of a fiercely competitive class of 31 riders in the THIS National Children’s Medal. After earning first round scores in the 80s, all four riders proved their position in the challenging work off. After a long day of fun, lots of riding, and hard work, riders were excited to watch Saturday night’s Hildebrand Fund $30,000 Grand Prix. Pin Oak’s equitation riders are anticipating Sunday’s ASPCA Maclay, USHJA 3’3” Jumping Seat Medal, and Platinum Performance Talent Search. Meanwhile, the junior hunter and jumper competitors are looking forward to classic day as well as the chance to earn tricolors as their divisions wrap up on Sunday. Katy, Texas – March 30, 2019 – Week II of the 2019 Pin Oak Charity Horse Show is flying by as the week wraps up with big wins before the weekend. The jumper ring shined during the first part of the week with the $10,000 1.45M Welcome Stake on Wednesday evening and the $25,000 Walter Oil & Gas Corp. Grand Prix and Bedoya Ringside Reception Thursday afternoon. Jordan, ridden by Jill Gafney and owned by Freestyling Farms, LLC, took home the top honors in Wednesday’s 1.45M Welcome Stake. BKS Horse Farms, LLC’s Dante with Faces of Pin Oak rider Briley Koerner finished 5th in the Welcome Stake, as well as winning the 1.45M Under 25 for the Welcome Stake. NKH Caruso owned by NKH LLC and ridden by Mathis Schwentker were victorious in Thursday afternoon’s $25,000 Walter Oil & Gas Corp. Grand Prix while Vigo Du Levant, owned by L.O.O. LLC and ridden by Jaelynn Downing, rode to the top honors in the 1.45M Under 25 Grand Prix. Meanwhile, ‘Derby Day’ at Pin Oak 2019 Week II featured the Baggett Family $10,000 USHJA National Hunter Derby Friday morning and the Walsh and Albert $30,000 USHJA International Hunter Derby Friday afternoon accompanied by the Bluebonnet Feeds Margaritaville party. Amidst light springtime showers on Friday morning, Kelley Buringa rode Bottom Line Equestrian, LLC’s Valentine to the win in the Baggett Family $10,000 USHJA National Hunter Derby. Valentine and Kelley led the class following the classic round with a score of 91. The pair remained consistent, scoring a 94 in their stellar handy round. “This was our first derby together. And we just had our very first class together last Thursday,” Kelley explained. “He was just spot on today. There was, of course, some pressure coming back on top, and I knew I had to make the inside turn to the trot fence since everyone else had done it. But he was right there with me every step of the way. It was a great feeling and a really fun class,” she continued. Hoopla, ridden by Peter Pletcher and owned by Hollis Grace, took home the red ribbon in Friday morning’s National Derby while Jennifer Alfano and All Ferraris, LLC’s Enzo W took third. Brooke Brombach was the highest placing junior rider finishing in fifth place with scores of 88 in both the classic round and the handy round aboard Erica Moe’s Classico. Friday afternoon’s $30,000 Walsh & Albert USHJA International Derby was run in the ‘Hunt and Go Format,’ newly offered at Pin Oak 2019. The Hunt and Go format is similar to a power and speed class in the jumper ring; all riders continue directly on to the handy round following their classic round without stopping or exiting the arena. This format is great news to riders of younger horses or those new to riding in derbies since all competitors proceed to the handy round rather than only the top 12 horses being called back. Friday’s Hunt and Go derby included a total of 14 fences, eight fences in the classic round and six in the handy. Riders were to pass through two standards following the end of the classic round to mark the beginning of the handy portion of the course. While spectators and exhibitors enjoyed the Bluebonnet Feeds Margaritaville party, amateur and junior competitors topped the field of 25 horses. Symbolic, owned and shown by junior rider Bella Kay, won the class scoring 348 points overall, following an impressive second place finish in the USHJA International Derby the week prior. MTM Do Right took second place with owner and amateur rider Didi Mackenzie while Miramar, ridden by amateur Isabella Littlejohn and owned by Nancy Littlejohn, took third. “Actually, it’s nice because you don’t have time between rounds to overthink, but it can be hard to go so long. It helped that my horse gets excited and perks up when we start doing the handy turns, so it wasn’t as hard to keep going,” she continued. “For me, today was really just about going around, being smooth, and doing our best. I was so happy when we were second in the International Derby last week, and I wasn’t expecting to be better than that, especially with how many professionals are here and how many incredible horses were in the class,” she said when asked about her win in the International Derby. Bella purchased Symbolic three years ago to be a fun, confidence building mount. “This Thursday I will have had him three years. We got him to be a fun horse for me because the green pony I had at the time was not so fun. He has definitely taught me a lot and helped me build confidence. The win will be a great way to mark our anniversary,” she said. For Symbolic and Bella Kay, this marks another milestone as it is Symbolic’s first International Derby win as well as Bella’s. The pair started doing International Derbies in the fall of 2017. They won a USHJA National Derby in Saugerties in 2017 but have never bested International Derby competition. “He came in second a few times with Kelly Farmer before I owned him but had never won. He was definitely a derby pro, but he had never had a derby win, so I’m very excited we could achieve this together,” Bella explained. Bella is also looking forward to riding Symbolic at the USHJA International Derby Finals in Kentucky later this year. As Week II of Pin Oak 2019 enters the weekend, junior riders are looking forward to another fun weekend of showing while jumper riders and spectators are excited for Saturday’s big event – the Hildebrand Fund $30,000 Grand Prix and Avalon Advisors Ringside Gala. Daniel Bedoya was taught to respect and value horses from the start. Growing up in La Paz, Bolivia, his father, Daniel Bedoya Sr., won seven national jumper championships in Bolivia. But even more than his success in the show ring, Bedoya Sr emphasized that anyone who wants to ride needs to bring their best to the horses at all times. When Daniel describes his childhood in La Paz, he talks about how his father’s passion for riding motivated him to get up at 5am in order to ride before his job working in construction. He would even rush to the barn during lunch to get a ride in. Bedoya Sr demanded the same of his children if they chose to ride. “My sister was very talented,” Daniel says, “but just didn’t want it as much.” Bedoya Sr. told his son that if he wanted to ride, it was all or nothing. He had to take it seriously, to forego nights out with his friends if he wanted to jump the next day, to show up every single day to work on his sport. The family moved to Austin, Texas when Daniel was a young man. Bedoya Sr. set up a training facility there, which he continues to run full time at age 74. “He rides four horses a day. He teaches lessons. He gets on the tractor himself to drag the arena,” Daniel says with clear admiration. Daniel continued in the family tradition and set off to Magnolia, Texas, where he and his wife Lindsay run Bedoya Training Stables. Lindsay is critical to the operation. She travels with him to help in the big classes when she can or stays home with their daughter to keep the horses and students in work. “It’s special to me that we’re doing this as a family,” he says. In fact, when Daniel and his horse Quattro represented Bolivia at the World Equestrian Games at Tryon in 2018–the first time a Bolivian represented the country on the world stage–his Texan fans cheered him vigorously in the main arena. The Great Southwest Equestrian Center even stopped the horse show to broadcast his rides on the big screens so that his home crowd could watch and cheer for their friend. Riding at WEG belt beyond Daniel’s wildest dreams even two years prior, and he counts carrying the Bolivian flag as his proudest equestrian achievement. He credits his horse Quattro for the opportunity. Quattro is the horse of a lifetime for Daniel. He bought the 18hh gelding as a five-year-old resale project. “He turned out to be harder to train in the beginning than I expected,” Daniel recounts cheerfully. He took the “shy, gentle giant” to his first horse show as a youngster, having no idea this would be the horse to completely change his career. “I may get to the point where I ride better horses than him, who win more than he wins, but none will have the impact he has had on my career. He changed my life.” For Daniel, there will never be another Quattro. The successes the pair have already achieved have opened doors for Daniel. Competing at WEG, opportunities to ride more elite horses, and attracting quality clients to his program have all come about thanks to Quattro’s eagerness to try. Daniel also thinks fondly back to his now eight-year-old daughter’s early childhood. He would sit her in front of him on the huge horse’s back and walk and trot around the ring, introducing his daughter to horses and sharing quiet moments with her. “My daughter is my biggest fan,” he says. While she hasn’t caught the riding bug, she joins the Texas community in cheering for her father’s victories. “Sometimes she cries if Quattro and I don’t win,” he chuckles. Pin Oak has been a large part of Daniel’s career success. There he Quattro have claimed many victories, including rising to the top of the leaderboard in the 2018 Antares Sellier Leading Grand Prix Rider. He loves the show for its combination of collegial environment and prestige. Pin Oak is special to Daniel because of the charitable giving aspect. He recounts a charity equitation class to benefit a fellow professional who was having medical troubles a few years ago. “It wasn’t part of Pin Oak but they helped us with it, and now they’ve made it part of their show,” he says with pride. Daniel’s buoyant spirit and passion for the horses make him a popular fixture of the Texas riding scene. He and Quattro have a bright future ahead of them. Natalee Haggan’s parents promised her a horse of her own when she was eight years old, provided she stuck with the riding lessons she begged for. She showed her dedication early, always staying late at the barn late to help out with chores. “Thirty years have gone by and I’m still waiting for the horse,” the now successful professional jokes. Natalee’s determination has opened doors. In 2000, she convinced the hiring manager at Medieval Times (a popular dinner theater chain restaurant) to take her on, even though at the time the business officially did not hire women in the role of riders. But Natalee impressed the horse trainer with her skills. Through that experience, she learned a lot of incredible dressage skills the horses needed to perform in the show. After three years at Medieval Times, Natalee returned to the show ring. She missed jumping. She borrowed a horse from MTM farm for a week, and again impressed people with her work ethic. She got opportunity to take care of the farm while the owners were on the road, and worked her way into the manager and trainer position. Things were going well for Natalee when, in 2017, a 2”x6” board fell on her head and left her in critical condition. Once again, she would have to defy the odds. Pin Oak became the stage for her comeback. She grew up watching the Pin Oak Grand Prix and dreamed of riding in it long before she had the financial means to make it at the rated level. “I just rode whatever I could swing a leg over,” she remembers. Now, as an accomplished rider with access to nice horses, she had to put the pieces together while recovering from her serious injury. In 2018, just seven months after her accident, her dream came true as she rode into the ring in the Wells Fargo $30,000 Pin Oak Grand Prix on MTM Full House. The evening progressed from dream to fairy tale as she and Fuller had the only double clear round of the night. “Winning was surreal,” she recalls. Natalee lists winning this class as her proudest equestrian accomplishment. She also has a special bond with Fuller, a Hanoverian gelding McCormick and Fenney imported in 2015. Fenney rode him in a few Grand Prix before handing the reins over to Natalee just before her accident, but left the ride to her and gave Fuller time off competing while Natalee recovered. The future is bright for Natalee, whose next big goal is to win an international hunter derby. “I’ve come in second in my last two international derbies,” she says, “and last time I was only one point off the winner.” She’s also looking forward to more Grand Prix wins as well as bringing along the promising young horses at MTM. Wherever she goes in her career, Pin Oak will always be special to her. “Pin Oak is a great contribution to the horse world in the sense that it allows different breeds and disciplines to compete side by side. Even though we are all involved with riding it is very interesting to watch and learn how differing breeds and disciplines train, compete, and even manage their horses in the stabling area. Each breed and discipline have their own unique traditions that I find interesting,” Natalee says. While anyone with Natalee’s level of success would know a thing or two about luck, she is also a demonstration of what really wanting it and putting in the time can bring. Watch for this talented rider at the horse shows this year. Want to get all the latest Pin Oak news and events direct to your inbox? Just enter your details below to subscribe to the Pin Oak email list. POCHS reserves the right to make changes to schedules and venue.